In today's NY Times, Mark Wu (law professor Harvard) writes that America's trade problem is not caused by the value of the Chinese RMB. He argues that we really do not compete against China because the products the US exports are different than the ones that China exports. He also points out that during the period 2005-2008 the RMB rose in value, but US exports to China did not increase. Parenthetically, the current account trade deficit also increased between the two countries during that period. However, he ignores some basic economics. First, the change in value of the currency will make Chinese products more expensive in the US market if the Chinese vendors take payment in the RMB, or if they adjust dollar denominated prices to reflect the value of the RMB. It may in fact, be in the long run before the prices of imports adjust as businesses are slow to change prices. In fact the recession was effective at reducing the current account balance between the countries. Viewing the number from 2008 to 2009 the balance declined by over 15%. Adjusting the currency value will help close the gap which us unsustainable in the long run. Professor Wu also ignores the GDP impact of the trade argument. To offset the current account balance there must be a capital account baalnce, meaning China has to do something with the dollars it gets from trade. Moving the dollars should weaken the dollar against all currencies. But if the Chinese artifically inflate the dollar, then the adjustment will not take place. Economics is dynamic. You have to account for botht the flows and stocks to measure change. Professor Wu's mistake is not to account for the long term possibilities based on the currency value and to ignore the actions of Chinese government and business to deflate the value of their currency with respect to the dollar. The loss of these wonderful people should make every one of us strive to be better in our private lives – to be better friends and neighbors, co-workers and parents. And if, as has been discussed in recent days, their deaths help usher in more civility in our public discourse, let’s remember that it is not because a simple lack of civility caused this tragedy, but rather because only a more civil and honest public discourse can help us face up to our challenges as a nation, in a way that would make them proud. Many of us have criticized the President in months past for a lack of fire in his pursuit of policy goals. While trying to navigate the highly partisan divide in Washington, the President's cool seems like detachment from the struggles of working families. Today we see how valuable his calm can be in helping us through the most painful moment possible. I hope this moment leads to "a more honest and civil discourse" and his leadership continues to soar. Back from Denver and going right into the classroom to kick-off a new term in Macro. Based on discussions at the AEA in Denver I will have a few different ideas to share with students tonight and at various times during the term. William K. Black of UMKC, former regulator and author of The Best Way to Rob a Bank is to Own One, opened the conference with an ASE keynote. He took us back to the last banking crisis - the savings and loan debacle of the 80's. The crisis was brought about by interest rate risk caused by the big run-ups in rates from the FED trying to wrench out inflation. The high rates gave s and l's incentive to create high returns in order to eke out any profit. Some took it as a license to commit fraud. The most popular stories are the Keating (Lincoln Savings and Loan) and (Oklahoma stories) retold in Funny Money. Black recounted the salient fact that federal regulators made thousands of referrals to criminal authorities during the s and l debacle. As far as we know there have been none as a result of our current crisis. Securitization of mortgages the bad penny (well trillions of them) that keep on returning. This morning began with an interesting panel discussion regarding the relationship between economic inequality and the recent financial crisis. The main presenter was Prof Rajan from Chicago who reviewed the notion that the reaction to growing inequality in our society led to policies that fed the housing bubble. Discussants were Profs Acemoglu and Glaeser. Acemoglu grabbed my attention by quoting from Robert Dahl and Who Governs...but he tried to politely refute the hypothesis from Rajan. As always, Glaeser had strong numbers showing the weather related connection between housing boom and bust. In follow-on discussion Prof Glaeser had the insight of the day. That education is the path to improved performance and equality in society. However he recognizes that the policy must be put forward as a matter of national strength and security as inequality is a political non-starter. While I believe we do need to address inequality not necessarily in the context of education. While still too high the numbers indicate that small business failures declined from first quarter 2009 to first quarter 2010. These are interesting numbers to watch. The American Economic Association (AEA) has its annual meeting this week in Denver. The Executive Committee is considering a code of ethics to guide members that do work outside their academic or research institution requiring disclosure of the information. While this sounds like a great idea; readers of academic papers, textbooks and students in the classroom have the right to know that their professors are in the pay of other institutions, the impetus for this action is fascinating. The proposal, which has not been announced to the public or to the association’s 17,000 members, is partly a response to “Inside Job,” a documentary film released in October that excoriates leading academic economists for their ties to Wall Street as consultants, advisers or corporate directors. That's right. It was not the financial meltdown per se (and the participation of members of academia in its cause), but rather a documentary film that made certain members of the profession look bad. I will be in attendance at the conference and will be interested to see if this is discussed and adopted. One of the concepts I stress to Macro students is "Okun's Law". Created by famed Brookings Institution economist Arthur Okun, the Law states simply that for each percentage above the natural rate of unemployment, the economy is losing 2% of potential output. So in round numbers, if the unemployment rate is 10% and the natural rate is 5% (both are probably lower right now, but the spread is the same...about 5%) then the economy is losing 10% of potential output. Roughly speaking then we have a recessionary GDP gap of 10%. In a 14 Trillion dollar economy that means we are down about $1.4 Trillion in output. Paul Krugman blogged over the holiday about this point and illustrated his analysis with data from the Federal Reserve Bank of St. Louis. 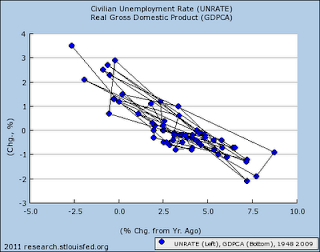 The illustration shows that when economic growth is negative, unemployment shoots up. When economic growth is strong (in the neighborhood of 3.5 to 5% on an annual basis) then the unemployment rate will slowly reduce. My conclusion is that based on the low levels of growth projected in 2011 and without significant stimulus from government spending the unemployment rate will stay very high. The tiny stimulative effect of the tax changes signed into law could be overwhelmed by state and local cutbacks and federal reductions in spending. While cutbacks may make good political theatre, they endanger the tepid recovery from the very traumatic events of 2008 and the housing and financial bubbles. Today is our seventh wedding anniversary in addition to being a holiday. We have had a very enjoyable break and tomorrow i will be back to regular updates. I wish everyone a healthy and prosperous 2011.